I’ve gotta do something about all this hair! Ohh, how cute, a dark-hued person and a light-hued person mated and made a cappuccino cutie! Yeah?, well, these cappuccino cuties grow up with really fucked up hair!!! No, no, it’s not that bad. Genes are a helluva thing, though. My indigenous heritage wants to grow thick and long. My African heritage wants short and coarse. The result? We’re trying to find out! Now that we’re past shoulder length, my hair has to be sectioned off even further. Two braids split from the middle makes me look like a Klingon, so I have to tamp down the center just to get all the hair to lie flat against my scalp! Let loose, my hair resembles a lion’s mane, and even then, I have to hide two thick braided cords in the center to keep the mane sane. 2nd – flat braid base from one ear to another. Tuck 1 into 2 to fuse. 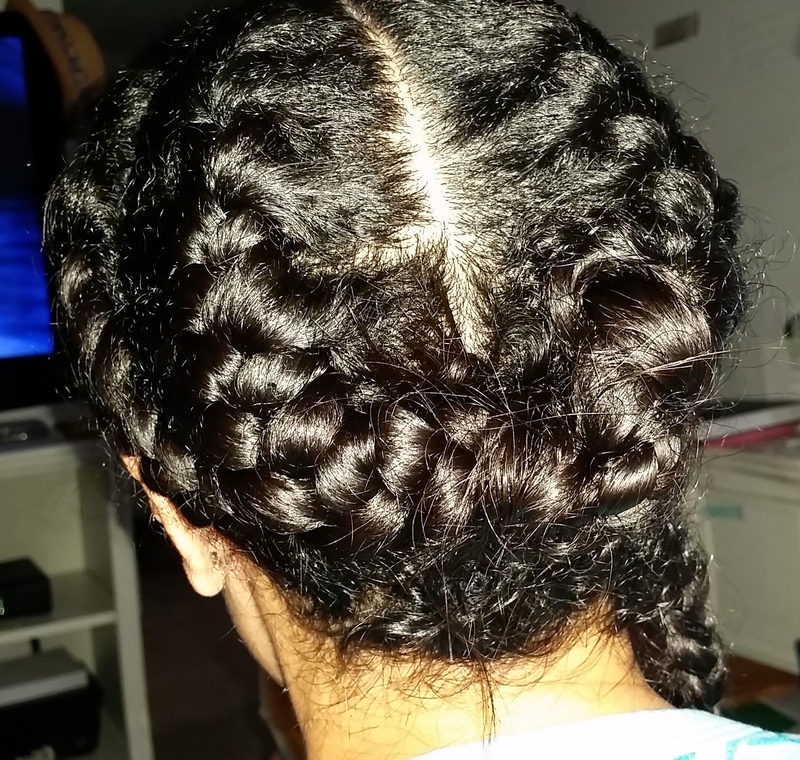 3rd and 4th – two French braids, one tendril tucked into the unfinished 4th. My fail, shoulder was hurting, so couldn’t tightly keep yoke in place. Definitely need a spotter! Yet I’m a zealot for meeting challenges. I said last year I’ll keep it growing, since I’ve never had long hair unless added in, so I will. Let’s see if this summer’s constant braiding will get my tendrils towards the end of my spine. Posted on May 2, 2015 June 8, 2016 by Von SimeonPosted in Art, Culture, DIY, Fashion, Hair and Fashion, Humor, Photography, StyleTagged Bavarian Braids, Braiding, Braids, Curly Girl, Multiethnic Hair. Next Next post: No Fear. No Doubt. Lose Control. My goodness that is a lot of work! Looks great but how long did it take! I have wavy coarse hair too. I tried to braid my hair when I was a kid, it turned out as a mess and my arms got very tired! Gave it up. You get a star for style and persistence. It sure is sicahue! Cumulatively 2 hours, but towards the end my right arm couldn’t stay in position, hence the sloppy U. Ahhh arthritis!